The world was once full of many diverse species of animals. When Humans arrived, they single handily changed this. Humans controlled the environment to their liking and drove large, easily huntable species to extinction, along with the other animals that depended on them. After 15 thousand years, the environment grew slightly accustom to the lack of diversity, and Humans kept to there selves, building large castles and towns, growing as a civilization. It looked like man and nature had finely reached an equilibrium. And then everything changed. Again. An asteroid 4 miles in diameter slammed into the planet, causing the destruction of almost all Human settlements and decimating the other species and environment. Any species that was not killed by the impact was either killed by later events caused by the asteroid or killed by Humans as food in their time of desperation. After another couple thousand years, tiny villages were constructed and humans slowly started to rebuild what they had lost, but the species lost in both extinction events could not. The wild areas are home to mainly escaped domestic animals, leaving the environment incomplete. Although there might not be any of those extinct species still alive, their DNA still remains, hidden in bones in caves and laying in the sand of deserts. Humans can now bring them back, and in so bring back the lost world of the Pleistocene. There will be no non-avian dinosaurs in this mod whatsoever. In fact, only late Pleistocene to Holocene species. Only them, so don't even ask about Dinofelis, Keleken, or Andrewsarchus. All aniamls will be vanilla in style, unlike JurassiCraft, It's About Time, or PrehistoriCraft (F&A is debatable). The DNA you collect will be found in bones, skin, flesh, scales, and feathers, which will come from piles of ancient bones in shallow caves and in sand and gravel with a sifter. Real fossils don't actually give DNA. We are in need of an animator for our mobs/animals. If you'd like to help us, just contact me here or through a PM. We are currently at work creating as many animals as possible, so we plan to add more to this page as soon as possible. hi guys, i am leonelsabertooth, i am a part of this mod (i made the siberian tiger, the smilodon, the bobcat the homotherium and the puma and im about to make more!) and im posting this massage to follow the thread. Yeah, we'll except modelers. Can I see your work? Some actual fossils give DNA, like a T-rex skeleton that was accidentally dropped from a helicopter. The bones still had bone marrow somehow (don't remember all the details), with blood cells that had some DNA. Of course, that was a one in a million chance, so ignore that. Mummies however, like the woolly mammoth calf found frozen in Siberia, do have some DNA, so that was just something to think of. Speaking of which, is there a reason I don't see a woolly mammoth up there? Still a pretty good idea though. The universe, it loves you. You have played the game well. Everything you need is in you. You are stronger then you know. You are the daylight, and you are the night. The darkness you fight is deep within you. But so is the light to purge it. You are not alone, and you are not separate from every other thing. You are the universe, experiencing itself, tasting itself, reading itself, understanding itself. Woolly Mammoth isn't made yet, were kinda doing a lot of carnivores right now because of reasons. Dakotaraptor, Balaur, Dromaeosaurus, Entelodont, Troodon. Ok, cool (I love Dakotaraptor, a large dromasuarid in Hell Creek? Awesome). Anyway, as long as your fine with making more simple models, your in. Another reaspn we dont have fossils is because is that fossils are bpnes after a long time (realy long time) . In this mod, the bones havnt got the time to make the fossil process, this is why you can find fur, scales and meat too. The astroid hit earth not alot time ago! Plus, like sargeant said, we are currently working on the carnivores, we already have kind of a list of the herbivores we will make. Do you have, like, a Dropbox, or a Skype group or anything? We have a group PM, and we'll be making a Dropbox soon. Oh, and if you don't already, I'd prefer you use Tabula to model. This mod is epic!!! i hope this mod will come out soon!!!! i also like the smilodon populator (leonel's version) and the siberian tiger. P.S: i think you should improve the fox. anyway i love this mod and i give it full support!!!! This looks like an awesome idea for a mod that has a lot of potential! I will eagerly await its release! 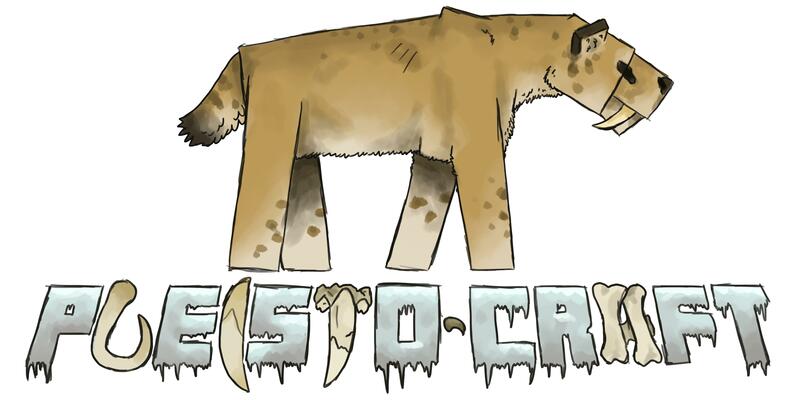 Personally, I want to see some "prehistoric" versions of existing Minecraft creatures-giant woolly pigs with mammoth-like tusks, tiger-sized ocelots, etc. Well, there will be wild boar and actual tigers, but not the ones you said specifically. Eventually, it's not apriority right now. Hey Guys! a new mob has finished! i present you the clouded leopard!!! hi people! we finished the American Lion! everyone who loves america and loves lion should love it! Aw, c'mon! Half the fun of prehistory is that almost all of it is missing from the fossil record. Who knows-maybe woolly pigs really did exist? We could have just never found the fossils. Where talking about the late Pleistocene, only 10-50 thousand years ago. Although we obivously don't know all the species that lived then, many of them we do. In fact, almost all extant species were around at that time too. You'll get boar and warthogs and tigers and Homotheriums and jaguars, just not woolly tusked pigs and giant ocelots. Yeah, if you think about it scientificly, what reason do evolution has to create giant ocelot and a wooly pig?